I don't want to brag, but...ok, that's a lie. I do want to brag. My hoop game is solid, people. No, not basketball but hula hooping. I'm taking it all the way back. A few weeks ago, I had to show some youngsters how grown folks get down. These young thundercats couldn't keep the hoop going for longer than 20 seconds and don't even get me started on their stiff knees, weak hip rotations, and amateur technique. But seriously, if Grandma Jenelle can dust off her old bones and step into the ring of fire, then anyone can do it. This photo is courtesy of a good friend that we'll call 361 Studios, she's an Instagram extraordinaire. 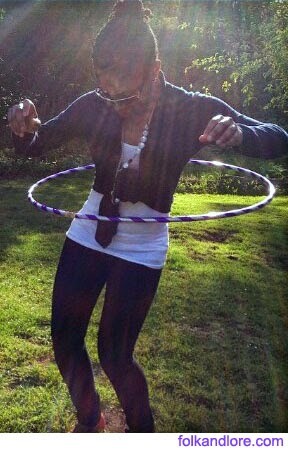 As a few added perks, hooping apparently helps bust belly fat and tone thighs. Plus, Michelle Obama does it so I'd say that we're in good company!